GALVANISED MILD STEEL. Mild Steel Exhaust Repair Pipe Tubing 2mtr 38mm 1 1/2". Mild Steel Exhaust Repair Pipe Tubing 2mtr 57mm 2 1/4". Mild Steel Exhaust Repair Pipe Tubing 2mtr 64mm 2 1/2". Mild Steel Exhaust Repair Pipe Tubing 2mtr 51mm 2". Supplied in 2mtr Lengths. Length: 2mtr. Our Range of Mild Steel Rigid Exhaust Tubing is perfect for Repairing, Upgrading & Replacing exhaust systems. EXHAUST REPAIR. 32mm 1 1/4" Steel 90 Degree Exhaust Pipe Bend Tubing Perect for Custom Exhaust. Exhaust Flexi Pipe Tubing. Length 50cm. EXHAUST REPAIR. Mild Steel Exhaust Repair Pipe Tubing 2mtr 64mm 2 1/2". Mild Steel Exhaust Repair Pipe Tubing 2mtr 57mm 2 1/4". Mild Steel Exhaust Repair Pipe Tubing 2mtr 51mm 2". Supplied in 2mtr Lengths. Length: 2mtr. Our Range of Mild Steel Rigid Exhaust Tubing is perfect for Repairing, Upgrading & Replacing exhaust systems. EXHAUST REPAIR. Rigid Mild Steel Exhaust Tubing. Part Number FRP13K. CAT REPAIR FLEXI PIPE FOR FORD FOCUS 1.6 1998-2004. Flexible Pipe Length (mm) 152. Mixture Preperation Intake Manifold Injection/ Carburettor. Model FOCUS. Drive Front Wheel Drive. 35mm 1 3/8" Steel 90 Degree Exhaust Pipe Bend Tubing Perect for Custom Exhaust. EXHAUST REPAIR. Mild Steel Exhaust Repair Pipe Tubing 2mtr 64mm 2 1/2". Mild Steel Exhaust Repair Pipe Tubing 2mtr 51mm 2". Exhaust Flexi Pipe Tubing. Length 50cm. EXHAUST REPAIR. 35mm 1 3/8" Steel 90 Degree Exhaust Pipe Bend Tubing Perect for Custom Exhaust. Mild Steel Exhaust Repair Pipe Tubing 2mtr 64mm 2 1/2". Mild Steel Exhaust Repair Pipe Tubing 2mtr 57mm 2 1/4". Commonly used on the EP3 Civic Type R. Steel Donut Exhaust Crush Gasket. Failure to do so will void your warranty. Tesh Number 410962. Part Number N/A. OE Number 18229S6MA51. GALVANISED MILD STEEL. 50cm Exhaust Flexi Pipe Tubing. 35mm 1 3/8" Steel 90 Degree Exhaust Pipe Bend Tubing Perect for Custom Exhaust. Mild Steel Exhaust Repair Pipe Tubing 2mtr 64mm 2 1/2". Mild Steel Exhaust Repair Pipe Tubing 2mtr 51mm 2". Mild Steel Exhaust Repair Pipe Tubing 2mtr 57mm 2 1/4". Mild Steel Exhaust Repair Pipe Tubing 2mtr 51mm 2". Mild Steel Exhaust Repair Pipe Tubing 2mtr 64mm 2 1/2". Mild Steel Exhaust Repair Pipe Tubing 2mtr 38mm 1 1/2". Mild Steel Exhaust Repair Pipe Tubing 2mtr 64mm 2 1/2". EXHAUST REPAIR. 35mm 1 3/8" Steel 90 Degree Exhaust Pipe Bend Tubing Perect for Custom Exhaust. Mild Steel Exhaust Repair Pipe Tubing 2mtr 51mm 2". Mild Steel Exhaust Repair Pipe Tubing 2mtr 60mm 2 3/8". EXHAUST REPAIR. 35mm 1 3/8" Steel 90 Degree Exhaust Pipe Bend Tubing Perect for Custom Exhaust. Mild Steel Exhaust Repair Pipe Tubing 2mtr 51mm 2". GALVANISED MILD STEEL. Mild Steel Exhaust Repair Pipe Tubing 2mtr 51mm 2". Mild Steel Exhaust Repair Pipe Tubing 2mtr 57mm 2 1/4". Mild Steel Exhaust Repair Pipe Tubing 2mtr 64mm 2 1/2". Mild Steel Exhaust Repair Pipe Tubing 2mtr 38mm 1 1/2". EXHAUST REPAIR. 32mm 1 1/4" Steel 90 Degree Exhaust Pipe Bend Tubing Perect for Custom Exhaust. 35mm 1 3/8" Steel 90 Degree Exhaust Pipe Bend Tubing Perect for Custom Exhaust. Mild Steel Exhaust Repair Pipe Tubing 2mtr 51mm 2". Mild Steel Exhaust Repair Pipe Tubing 2mtr 51mm 2". EXHAUST REPAIR. Mild Steel Exhaust Repair Pipe Tubing 2mtr 64mm 2 1/2". Mild Steel Exhaust Repair Pipe Tubing 2mtr 38mm 1 1/2". Mild Steel Exhaust Repair Pipe Tubing 2mtr 48mm 1 7/8". Mild Steel Exhaust Repair Pipe Tubing 2mtr 57mm 2 1/4". EXHAUST REPAIR. Mild Steel Exhaust Repair Pipe Tubing 2mtr 51mm 2". Mild Steel Exhaust Repair Pipe Tubing 2mtr 64mm 2 1/2". Mild Steel Exhaust Repair Pipe Tubing 2mtr 38mm 1 1/2". GALVANISED MILD STEEL. Mild Steel Exhaust Repair Pipe Tubing 2mtr 64mm 2 1/2". Mild Steel Exhaust Repair Pipe Tubing 2mtr 57mm 2 1/4". Mild Steel Exhaust Repair Pipe Tubing 2mtr 51mm 2". Mild Steel Exhaust Repair Pipe Tubing 2mtr 60mm 2 3/8". Part Number FRP8A. CAT REPAIR FLEXI PIPE FOR VW POLO 1.4 2001-2008. Exhaust System from catalyst to front silencer. Model POLO. Flexible Pipe Length (mm) 203. Fitting Position Centre. Mixture Preperation Intake Manifold Injection/ Carburettor. GALVANISED MILD STEEL. Mild Steel Exhaust Repair Pipe Tubing 2mtr 57mm 2 1/4". Mild Steel Exhaust Repair Pipe Tubing 2mtr 51mm 2". Mild Steel Exhaust Repair Pipe Tubing 2mtr 64mm 2 1/2". Mild Steel Exhaust Repair Pipe Tubing 2mtr 38mm 1 1/2". Mild Steel Exhaust Repair Pipe Tubing 2mtr 57mm 2 1/4". Mild Steel Exhaust Repair Pipe Tubing 2mtr 64mm 2 1/2". Mild Steel Exhaust Repair Pipe Tubing 2mtr 38mm 1 1/2". Mild Steel Exhaust Repair Pipe Tubing 2mtr 48mm 1 7/8". Part Number FRP20B. CAT REPAIR FLEXI PIPE FOR SAAB 41707 1.9 2005-2008. Model 41707. Fitting Position Centre. Flexible Pipe Length (mm) 243. Drive Front Wheel Drive. The Klarius range is known for its performance and reliability. Part Number FRP19C. CAT REPAIR FLEXI PIPE FOR PEUGEOT 307 2 2000-. Make PEUGEOT. Flexible Pipe Length (mm) 152. Drive Front Wheel Drive. Fitting Position Front. Year 2000-. The Klarius range is known for its performance and reliability. GALVANISED MILD STEEL. 35mm 1 3/8" Steel 90 Degree Exhaust Pipe Bend Tubing Perect for Custom Exhaust. Mild Steel Exhaust Repair Pipe Tubing 2mtr 64mm 2 1/2". Mild Steel Exhaust Repair Pipe Tubing 2mtr 51mm 2". Part Number FRP20B. 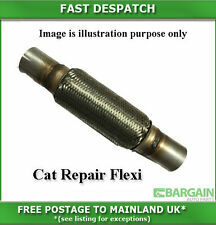 CAT REPAIR FLEXI PIPE FOR ROVER 75 1.8 2003-2005. Make ROVER. Flexible Pipe Length (mm) 243. Mixture Preperation Intake Manifold Injection/ Carburettor. Drive Front Wheel Drive. The Klarius range is known for its performance and reliability. Part Number FRP20B. 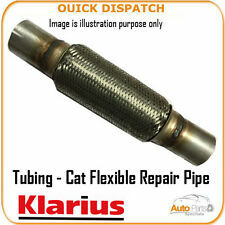 CAT REPAIR FLEXI PIPE FOR OPEL VECTRA 1.9 2005-. Model VECTRA C. Fitting Position Centre. Flexible Pipe Length (mm) 243. Drive Front Wheel Drive. Year 2005-. The Klarius range is known for its performance and reliability. EXHAUST REPAIR. Mild Steel Exhaust Repair Pipe Tubing 2mtr 64mm 2 1/2". Mild Steel Exhaust Repair Pipe Tubing 2mtr 57mm 2 1/4". Mild Steel Exhaust Repair Pipe Tubing 2mtr 51mm 2". Mild Steel Exhaust Repair Pipe Tubing 2mtr 60mm 2 3/8". Exhaust Flexi Pipe Tubing. Length 50cm. EXHAUST REPAIR. Mild Steel Exhaust Repair Pipe Tubing 2mtr 57mm 2 1/4". Mild Steel Exhaust Repair Pipe Tubing 2mtr 51mm 2". Mild Steel Exhaust Repair Pipe Tubing 2mtr 64mm 2 1/2". Mild Steel Exhaust Repair Pipe Tubing 2mtr 51mm 2". Mild Steel Exhaust Repair Pipe Tubing 2mtr 64mm 2 1/2". Mild Steel Exhaust Repair Pipe Tubing 2mtr 38mm 1 1/2". Mild Steel Exhaust Repair Pipe Tubing 2mtr 48mm 1 7/8". EXHAUST REPAIR. Mild Steel Exhaust Repair Pipe Tubing 2mtr 57mm 2 1/4". Mild Steel Exhaust Repair Pipe Tubing 2mtr 64mm 2 1/2". Mild Steel Exhaust Repair Pipe Tubing 2mtr 51mm 2". Mild Steel Exhaust Repair Pipe Tubing 2mtr 60mm 2 3/8". Part Number FRP14J. CAT REPAIR FLEXI PIPE FOR CHEVROLET TACUMA 1.6 2005-. Model TACUMA. Flexible Pipe Length (mm) 203. Mixture Preperation Intake Manifold Injection/ Carburettor. Make CHEVROLET. Drive Front Wheel Drive. Part Number FRP8A. CAT REPAIR FLEXI PIPE FOR VW BORA 1.9 2000-2005. Model BORA. Flexible Pipe Length (mm) 203. Drive Front Wheel Drive. Fitting Position Front. The Klarius range is known for its performance and reliability. Part Number FRP8A. Model POLO. Flexible Mounting. Fitting Position Centre. Flexible Pipe Length (mm) 203. Product Type Cat Flexible Repair Pipe. VW POLO 1.4 (1390cc) 2001-2008 Hatchback/Petrol BBY ,AUA 75/55 4/4 Front Wheel Drive -. Part Number FRP21A. CAT REPAIR FLEXI PIPE FOR CHRYSLER VOYAGER 2.5 2000-2008. Model VOYAGER Mk III. Flexible Pipe Length (mm) 152. Make CHRYSLER. Drive Front Wheel Drive. The Klarius range is known for its performance and reliability. Part Number FRP19C. Flexible Pipe Length (mm) 152. Drive Rear Wheel Drive. Fitting Position Front. The Klarius range is known for its performance and reliability. Width (mm) 57.5. Year 2000-2006. Engine CC 2402. Part Number FRP14J. CAT REPAIR FLEXI PIPE FOR VW GOLF 1.6 2004-2008. Flexible Pipe Length (mm) 203. Model GOLF V. Drive Front Wheel Drive. The Klarius range is known for its performance and reliability.